Office Pride is an industry leader in commercial cleaning and janitorial services. With more than 25 years of experience serving our clients with professionalism and integrity, we have one of the highest customer retention rates among our competitors – and that makes us proud! The cleanliness of your space, along with our core values-based approach, is a winning combination for our clients. Office Pride is recognized as one of the most advanced and admired full service commercial cleaning / janitorial franchises in the building services industry. We are a nationwide, faith-based, franchise that exists to equip people to build a profitable business that honors God. Our franchisees provide top quality janitorial services and total floor care delivered in a professional and consistent way, through our commitment to Integrity, Professionalism and Exceeding Expectations. Office Pride Commercial Cleaning Services has created a complete, turnkey franchise business system with over 25 years of proven success in a virtually recession proof industry. B2B service franchise easy to learn, operate and grow. We believe for a business to be sustainable, a franchisee must be trained in every area of success, including sales, operations, hiring, strategic planning, financial management and more. Office Pride coaches how to sell commercial cleaning and floor care services and how to grow a business and therefore a business with equity. 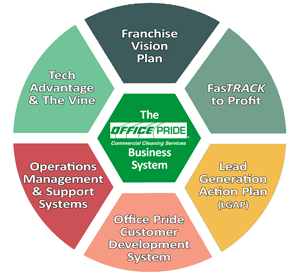 Office Pride fully understands that your growth leads to our growth. Our sole focus is to help you identify and achieve your vision and growth. We know that to ensure the most growth that you will need training and coaching on an ongoing basis. Office Pride is seeking candidates that want to scale and grow a large business, while building a support team that will help you focus on growing the business. Office Pride is a 5 Star VetFran Top 100 Veterans franchise with a 25% discount for Veterans.